This Pinup Photo was added on Tuesday 18 June, 2013. Thumbnail above is Watermarked. One of the most iconic bomber aircraft of all time, the Boeing B-17 Flying Fortress paved the way along with B-24 Liberators deep into Europe and to the Third Reich's front door. Thousands of B-17s were built during the war and while the B-24 dropped more bombs and were built in higher numbers; the B-17 became the face of the strategic bombing campaign because of aircraft like the B-17F Flying Fortress known as the 'Memphis Belle' which toured through the United States promoting the buying of War Bonds after the crew became the first to completed 25 missions. 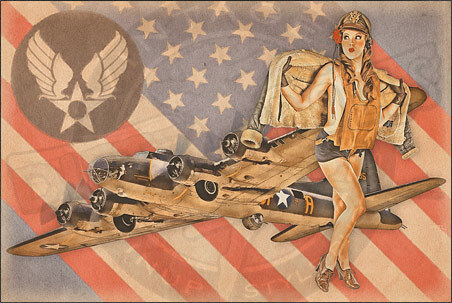 The Dietz Dolls Aviation Pinup Series features World War 2 aircraft (called Warbirds) paired with a pinup model wearing authentic flight clothing to the 1940s era. Available for purchase in all sorts of different sizes including posters!